Global climate change, fueled by skyrocketing levels of atmospheric carbon dioxide, is siphoning oxygen from today's oceans at an alarming pace—so fast that scientists aren't entirely sure how the planet will respond. Their only hint? Look to the past. In a study to be published this week in the journal Proceedings of the National Academy of Sciences, researchers from Florida State University did just that—and what they found brings into stark relief the disastrous effects a deoxygenated ocean could have on marine life. "We want to understand how volcanism, which can be related to modern anthropogenic carbon dioxide release, manifests itself in ocean chemistry and extinction events," said study co-author Jeremy Owens, an assistant professor in FSU's Department of Earth, Ocean and Atmospheric Science. "Could this be a precursor to what we're seeing today with oxygen loss in our oceans? Will we experience something as catastrophic as this mass extinction event?" For this study, an international team of scientists set out to better understand today's oxygen-deprived oceans by investigating the Toarcian Oceanic Anoxic Event (T-OAE), an interval of global oceanic deoxygenation characterized by a mass extinction of marine organisms that occurred in the Early Jurassic Period. 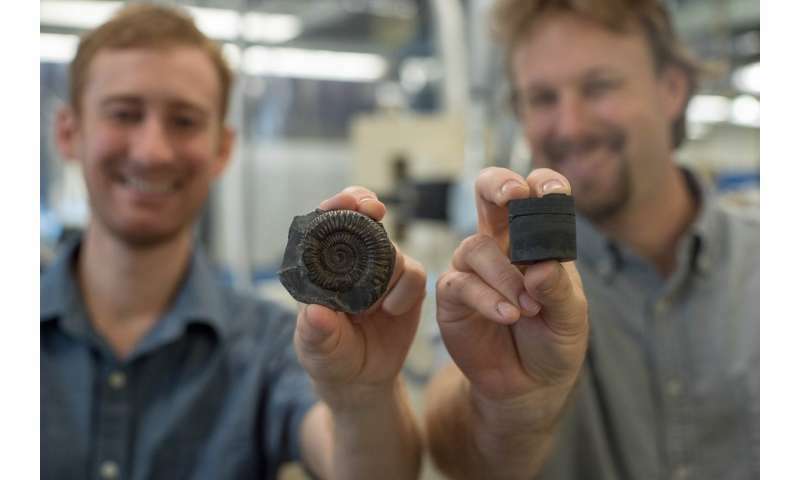 "We wanted to reconstruct Early Jurassic ocean oxygen levels to better understand the mass extinction and the T-OAE," said Theodore Them, a postdoctoral researcher at FSU who led the study. "We used to think of ocean temperature and acidification as a one-two punch, but more recently we've learned this third variable, oxygen change, is equally important." That initial deoxygenation, researchers say, was precipitated by massive episodes of volcanic activity—a process not altogether unlike the industrial emission of carbon dioxide we're familiar with today. While researchers have long surmised a link between volcanism, loss of oxygen and mass extinction, this study provides the first conclusive data. Prehistorical examples of carbon dioxide deluges and suffocating oceanic deoxygenation provide a lesson in how Earth systems respond to a variable climate. This analysis of the T-OAE, and the onset of deoxygenation that preceded it, is another in a lineage of reports that presage a bleak future for oceans with diminishing levels of oxygen. "It's extremely important to study these past events," Them said. "It seems that no matter what event we observe in Earth's history, when we see carbon dioxide concentrations increasing rapidly, the result tends to be very similar: a major or mass extinction event. This is another situation where we can unequivocally link widespread oceanic deoxygenation to a mass extinction." Steps can still be taken to curb oxygen loss in the modern oceans. For example, conserving important wetlands and estuaries—along with other environments that absorb and store large amounts of carbon dioxide—could help to blunt the effects of harmful industrial emissions. But should our oceans' oxygen contents continue to decline at their current rates, future marine organisms could be doomed to the same fate that befell their Jurassic ancestors. "If you're an oxygen-consuming organism, you don't want to see major changes in marine oxygen levels," Them said. "You either adapt or go extinct." In order to better believe the utility of whether the pre-T-OAE- event volcano derived CO2 is a valid parallel to today's CO2 rise, I would certainly need to see an estimate of CO2 levels at that time. And compare it with current levels. Help is on the way! A Squamish BC company has developed a CO2 absorber system built from "off the shelf" parts to extract CO2 from the air. I blows air through the system and pulls out all the CO2. Tied to a solar panel driven H2O splitter, they take the H2 and CO2 to create diesel, jet fuel and gasoline which can be directly pumped in to vehicles. Every country in the world can use one of these systems to create their own fuel independence while leaviing the fossil fuels "in the ground". Make fuel from the air. What a concept. We would also obviously be drawing down the airborne CO2 in the process potentially stopping and eventually reversing our polluting of the air with fossil fuel emissions. Again, it uses relatively inexpensive off the shelf parts to create fuel. Apparently creating I believe about 1 liter of fuel from 1 ton of CO2 extracted from the air. Bring it on!!!!! Unless, of course 'someone' buys all rights then shelves it. So 1 liter of fuel contains half a ton of carbon? And where are they getting the hydrogen? No, burning one mole of gasoline (114 grams) produces eight moles of CO2, with a weight of 352 grams. Roughly a ratio of 3:1. Energy must go in before energy can come out. Attaching hydrogen to carbon takes more energy than burning the hydrocarbon releases. After a few cycles the energy for recombining comes from where? Would it not be easier to use the mysterious energy source directly? I suppose jugs of water on a wheel constitute a perpetual motion machine which will keep putting out energy until the sun grows cold.